The ‘Festival of Life and Death’ (‘FoLaD’) is a global events/movement for a world without suicide, and all this means. Suicide awareness/prevention/education – especially breaking suicide taboos and stigma. Promoting/enabling individual and societal wellness via free community ‘festival’ events that involve local people performing/participating in all sorts of wellness experiences, especially arts/music/dance, nature/animals, crafts, yoga/mindfulness, good food and drink, and simply talking and listening, unleashing the powers of ‘lived experience’ guides/teachers/role-models/etc. Helping people bereaved by and affected suicide and other grief/trauma is also integral to FoLaD. FoLaD is a free, extremely adaptable, ‘open concept’ for anyone to use and align with. ‘Nudge Theory’ and ‘Trojan Horse’ are embedded in the FoLaD concept design. Also FoLaD is very ‘lean’ (simple, low cost, easy), and autonomous/de-centralised. FoLaD is a community empowerment and transformation movement. Communities can use it/align with it without having to seek permissions and approvals. Make of it what you can, because only you know what your community wants, and how to shape the FoLaD concept. That said we’re very happy to guide/advise – to facilitate. ‘Zero Suicide’ is an important FoLaD philosophy. This is beyond traditional healthcare – it’s societywide – in fact it’s worldwide. 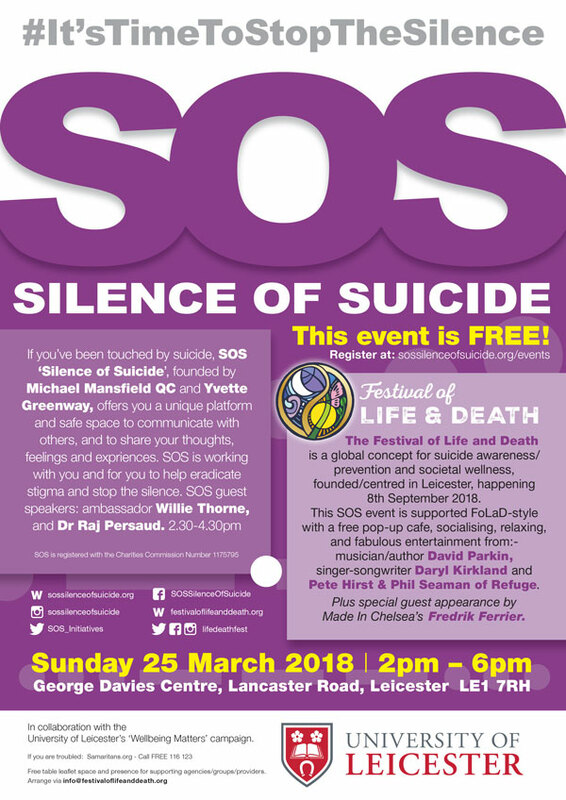 ‘Zero Suicide’ is a societal or organisational vision/commitment to seeking and striving for a society in which no-one suffers so much that they’d consider taking their own life. Note that suitable/nuanced/alternative language is essential when referring to ‘Zero Suicide’, depending on audience. ‘Zero Suicide’ is not a job target, nor a basis for blame/guilt. Nor an erosion of a person’s right to end their life when suffering terminal illness, or when all quality of life is hopelessly lost and not recoverable. Nor the removal of a person’s right to contemplate suicide, nor to attempt suicide. ‘Zero Suicide’ is a vision and aim for society; not an instruction to sufferers, and definitely not a suggestion of failure for carers and bereaved. We must consider definitions very carefully in language/terminology of suicide and ‘Zero Suicide’ in relation to euthanasia, ‘assisted dying’, ‘assisted suicide’, etc. Institutions/legislators must now produce more nuanced accurate definitions for suicide and related ‘life-end’ interventions, enabling clear separation between suicide that results from delusion, and ‘suicide’ that is described more accurately as voluntary euthanasia. ‘Zero Suicide’ must always be explained to be a broad societal/leadership/organisational vision or aim, and not a basis for individual blame or guilt. The challenges of language and perception will reduce with explanation, conversation, and as suicide taboos weaken, and awareness grows. Meanwhile the need for clear bold leadership visions for ‘Zero Suicide’, and a collective will/determination to make it happen; first to adopt the vision, and then everyone work together to make it a reality. Anyway, why should there not be a ‘Zero Suicide’ vision – everywhere? Who could possibly argue against a world without suicide? Interestingly suicide offers a unifying opportunity that transcends national and other boundaries, like nothing else. Every nation and organisation will generate extraordinary societal and economic benefits by prioritising suicide prevention, a well world, and all that this means. Suicide is the ultimate bad outcome from most of the challenges of the modern world, not just mental health. Suicide kills more than wars and murders combined. And so suicide holds the key to fixing basically anything. There are about one million suicides globally every year (World Health Organisation stats of 800,000 are under-reported/recorded, mainly due to stigma). The UK/US economic costs of each suicide are upwards of £1.8m/$2m. For every suicide there are about 20 attempted suicides, and there are at least 16 people contemplating suicide (‘suicide ideation’) for every attempt. Very conceivably this ratio is much higher, but nobody knows because we don’t measure any aspect of suicide properly, which we must now do urgently, by every perspective where there is a responsibility for the wellbeing of people (notably employers), and anything that affects the wellbeing of people. For such a horrific waste/opportunity, the maxim “If you don’t measure it you can’t manage it” is compelling. A major 2018 Lancet study estimated the cost of mental illness at $16trillion for the years 2010-30. The 2019 GDP of the world is less than $90trillion. A major London (Lord Mayor’s) report on the hidden costs of mental illness put the cost of mental illness at £24-27bn, equating to 10% of London’s GVA (total financial productivity). FoLaD aligns greatly with the Thrive mental/physical/societal health intiatives (notably ThriveLDN [Greater London Authority] and Thrive West Midlands), and is committed to establishing Thrive East Midlands (enabling joined up ‘Thrive Midlands’). If you want to be involved please contact us. The first main FoLaD events were on and around Saturday 8th September 2018. Thank you to everyone who attended and participated and helped make these events happen. A draft report is now available on request by email if you contact us. Festival of Life and Death events will happen again weekend of 6-8th September 2019, and any other time, anywhere anyone wants to organize one. The founding venue was Leicester’s Haymarket Theatre (Saturday 8th September 2018). See 8th Sept 2018 event programme for Leicester FoLaD Haymarket Theatre. Here’s a poster for the Bournemouth UK FoLaD. The Blaby Leicestershire FoLaD event (the main Leicestershire supporting event) was attended by over 600 people across several different venues. A report on inputs, activities, attendances and outcomes will be published openly here as soon as possible. A draft report is now available on request by email if you contact us. You can also create your own personal and/or organizational profile on the FoLaD website. 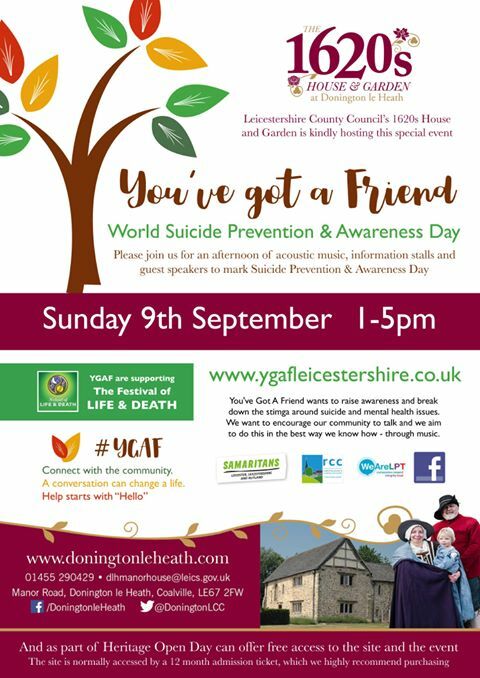 The wonderful #YGAF project, founded in Leicestershire a few months before FoLaD, organises music and wellness festivals to promote suicide awareness and prevention. The #YGAF poster is a simple example of referring to The Festival of Life and Death and using the logo. Anyone can do so for any event. It’s a way of joining together. The more we connect, the more we promote suicide awareness and prevention, share initiatives, ideas, best practice, and the publicise need to bring suicide out into the open where it’s not so dangerous. The Festival of Life and Death aims to prevent suicides and improve societal wellness..
Actually to design suicide out of life and societies everywhere, and all this means. Why should we not do this? The Festival of Life and Death (‘FoLaD’) is a free ‘open source’ flexible scalable concept for people to share discussion, support, activities, experiences, and arts and entertainment, that enable us to advance ideas and actions for suicide awareness and prevention, to help people heal, and to improve how we all live. A FoLaD event might be a conference or concert, or more typically simply tea and cakes in a cafe, with some music/entertainment, and perhaps some ideas for wellness, such as therapies or crafts. 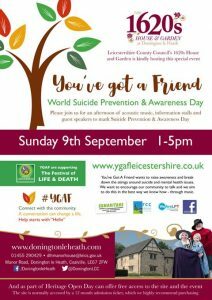 The Festival of Life and Death will happen on Saturday 8th September 2018, centred in Leicester (City and County) UK, and can extend to every other city/location of the world where people want to organize a FoLaD gathering. FoLaD events are happening, to varying degrees, in Bournemouth, London, Mansfield, Southend, Nottingham, other UK towns and cities, and other countries such as Australia, India, Afghanistan, Bangladesh, USA..
Find/use a sympathetic venue – large or small – or use your own premises. Get people together – for free – for talks, music, art, and other ideas and activities that involve mental health and wellness. The Festival of Life and Death is a FREE ‘open source’ concept. Use it as you wish. If your event is of any scale and likely to attract very troubled people then please ensure experienced support is available, if anyone needs it. The founding ‘hub’ event is in Leicester, Saturday 8th September 2018. Other events can happen anywhere you want to organize one. Your event should be FREE, or voluntary donation only. Involve as many different groups, agencies, people as you wish. Involve especially musicians, singers, artists, speakers, etc., who are interested in mental health and promoting wellness. Also involve people offering therapies to improve and heal other people’s wellness. This is very wide-ranging. Things that truly give us joy. Find a sympathetic venue – or use your own venue – this can be anywhere that offers a place to sit and talk, eat and drink (especially cake and tea, etc), display art, etc. The venue can be large or small – with a PA system or not, depending on size. It is perfectly possible to organize a Festival of Life and Death event in a tiny cafe, or a pub or bar, or a school, or a church, or a village hall. If you are in a big town or city then you can assemble a team to host an event in a bigger venue, and get some funding or suitable sponsorship. Ask for people to speak/perform. For free ideally. Because the event must be free. Donations are ok but not essential. The aim is talking and listening and raising awareness and educating and promoting ways to get well and stay well. The aim is not to raise money. The aim is also for people to experience a happy well atmosphere, and happy well things, as well as feeling and being safe to share troubles and worries, etc. Please create an event that’s very ‘lean’ and with as little admin and infrastructure as possible. Be open to everything and everyone – because the aim is to get people talking and to make it happen. Be especially open to people affected by mental health issues – particularly suicide and other bereavement and traumas – because these people have wonderful inspiring stories to tell and share, and talking and sharing is healing. Be especially open to participation and organizational involvement from marginalized people. Trust people. Be inclusive. Be open. Importantly – especially for larger gatherings – connect with local listening and counselling volunteers and have people there at the event to offer support for anyone wanting to talk to a trained listener. Use the Festival of Life and Death logo please, if you want. Call your event a Festival of Life and Death event please, if you want. Most importantly organize an event that is a gathering for people to experience wellness and good happy enjoyable helpful things, and to talk and listen and learn. Find your own ways to advertise your event using whatever means you like. Tell us, so we can add your event to the list and help publicize it for you. The world makes it increasingly difficult for us to live well. A million people take their own lives every year. 2o million attempt suicide. Many many more think about it. In any room of a hundred people, several will have suicidal thoughts. Suicide rates have risen 60% in the past 45 years. The fastest rising rates of suicide are among children, teenagers and young adults. In a third of all countries, suicide is the main cause of death among young people. Someone you know has suicidal thoughts, but probably feels unable to talk about it. Suicide results from all types of mental illness – from bereavement to stress; from alcoholism to eating disorders. And countless other emotional and life situations. And yes bereavement is a mental illness. And almost always, suicide is not due to one single cause. Suicide is particularly concentrated among disadvantaged misunderstood and marginalized people. It is also much more common in men than women, but anyone can find themselves vulnerable to suicidal feelings if life becomes too difficult, especially if help and support is not given or sought. Isolation is particularly dangerous. Loneliness is a major cause of depression and mental decline/vulnerability, and also a major feature of serious suicidal contemplation. Prevention of suicide is simple in theory: Eat well, sleep well, socialise, exercise. Reduce stresses. Get help with particular anxieties. Be among caring loving people and avoid people who are uncaring or threatening. Live more naturally..
Get these things right, and suicide risk reduces, but prevention is not so easy in practice. So the world needs to change its attitudes. Treatment of suicidal anxiety/depression is much more difficult than prevention (although treatment is usually completely possible) however – 75% of suicides are among people who are not being treated. This is mainly because of the shame and taboo, which reinforces dangerous isolation, and stops people talking about their worries, or more dangerous feelings. And so we need to talk about it all. Much more than we are doing. This is one of the big purposes of The Festival of Life and Death…..
To break the taboos; to remove the shame and embarrassment; to give people and groups – everybody, a platform and a voice. Make it happen. Help do what our governments cannot. Help change how we live; how we keep well, how we take care of each other, and how we teach our children these vital things too..
Start planning your own Festival of Life and Death now. Please note that The Festival of Life and Death is evolving organically. The Festival of Life and Death is not a corporate commercial enterprise. It’s not ‘owned’ by anyone. It will be what you and other people can make it. And so its shape and precise elements, depending on location, will be determined by the many people becoming involved and making it all happen. Here’s the very first publicity release, which has now been outgrown a lot. Other venues and locations around the city and Leicestershire county will host related Festival activities. Other locations anywhere in the world can create their own FoLaD events. Bournemouth FoLaD (Dorset UK) is arranged for the Shelley Theatre. A London FoLaD is planned initially Newham, East London. Register your interest and book a place to attend and/or appear at the Participate page. Please subscribe to receive updates, to offer to speak/perform/help/become a FoLaD venue, city, etc. Below is the archive postings and info, which tells a a part of the story of FoLaD and its evolution from conception in 2017 and prior, beginning with the suicide of Liane Ashberry and the Rude Angel album of 2015. The first launch event was at LCB Depot in Leicester, Wed 8th Nov 2017, 6-8pm. Thank you to everyone who spoke, performed and attended. The Festival of Life and Death is not-for-profit, with very minimal infrastructure, and is open to involvement and help from anyone. This 2018 FoLaD will be a very dynamic event – lots and lots of speakers – in person at the theatre; some streamed in from around the world, and the entire event will be streamed out globally for free. The Festival of Life and Death will offer encouragement, opportunity, a platform, and a supportive audience – to all ‘ordinary amazing people’ who have a story to tell, experiences to share, ideas to advance – even if you just want to speak for two minutes (and in any case the maximum might be 10 minutes) – plus leading experts and celebrity speakers, and brilliant performers of music, poetry, and other moving, meaningful, uplifting artists. Those of us who’ve experienced and continue to survive and/or thrive through mental challenges – of all sorts – are able to give the greatest help and inspiration to others, and also give the greatest insights for those who seek to improve understanding, awareness, preventions and treatments, and organizational/educational governance in all areas of mental health. In addition to musical acts at the Haymarket Theatre conference venue, a major concert is planned for the evening of the conference event, at a bigger Leicester venue. We anticipate that the main conference event will be from about 10am to 6pm, comprising short talks (ordinary amazing people, experts, etc) interspersed with music and poetry etc (singer-songwriters, performance poets, choirs, comedians, etc). After 6pm the main conference event at the Haymarket Theatre will offer music and other entertainment until late. As already stated a larger separate music concert is planned at a different Leicester venue, and this will be paid-for tickets, to raise money for relevant charities. You will see here and in various media a clearer outline as it emerges. You can contact us to receive information and updates. We are now open for conference registrations, to invite involvement from helpers, supporters, experts, speakers, performers, charities, institutions, groups, and centres of excellence/knowledge for suicide and related mental health/wellness. The conference event is free or donation-only to attend. The Festival of Life and Death event is not-for-profit, and all donations received will be given to relevant charities, as will ‘profits’ from the larger evening concert. and anything that is part of wellness and a help for suicidal illness, and mental health generally. The event name ‘Festival of Life and Death’ aptly describes the Festival’s vast coverage and relevance. N.B. We appreciate that this event warrants great sensitivity and care. There will be provision of safe spaces and appropriate support for people who might want this. Suicide awareness – a primary purpose – is the tip of a vast iceberg of challenges and opportunities in mental health and wellness, globally, especially ironically in the ‘developed’ affluent world, and increasingly in the developing world, which can perhaps learn valuable lessons from mistakes elsewhere. Suicide results from any and every aspect of mental illness, and often a mixture of several: from work stress to money worries; from bereavement and all forms of depression, to eating disorders and addictions; from abuse and injury and disease, to injustice and homelessness; from crop failure and bullying, to social exclusion and divorce. Anything. And nobody is immune. And the cost to societies everywhere is incalculable. Around the world, every 30-40 seconds, a fellow human-being kills himself or herself. In the UK, and in many other parts of the world, suicide (i.e., poor mental health), kills 3-4 times as many people as road traffic accidents. You might occasionally see references to slightly declining rates of suicide in parts of the world (Eng/Wales for example 2015-16), but overall globally trends are rising, especially among young people. Societal indicators continue to signal the deepest worsening condition of global wellness – suicide rates are now about 60% higher than the 1960s/70s. Life has changed radically in the past 40-50 years, and human beings are simply not designed to live this modern way. And so societies and people become stressed, and become ill. Suicide is very controversial, and this makes the subject a very big lever with which to open and explore and improve how we think about, and improve individual and societal approaches to mental health – or life, because that’s what mental health is – life – the condition of being alive and human. Given the taboos we are addressing – suicide, death, bereavement, etc – we should be able to build quite a lot of pressure for change, as well as all the good that can come from such a gathering. We are keen to involve everyone and anyone – globally – individual people of all kinds, who are affected and interested for all reasons in mental health and wellness, together with the corporate sector, the state sector and state services – health and education particularly – and governments and authorities of all sorts. Great improvements can be made. If you want to help in any way, or receive further information, please get in touch, and/or register your interest, enquiry, or what you’d like to suggest or offer, using the Participate registration page. Incidentally the main conference venue, Leicester’s wonderful Haymarket Theatre complex, is re-opening in 2017/18 as an extraordinary state-of-the art venue and training centre, as part of a major Leicester city re-development. The Festival of Life and Death was instigated by Alan Chapman, founder of the free work/life learning website Businessballs.com, with the vital help of some truly brilliant people. Here is more about FoLaD and its reasons. Here is the outline for the first launch event, at Leicester, 6-8pm, 8th November 2017.. Thanks for joining us for talks, live music/poetry, Q&A and involvement in this groundbreaking event on Sat 8th September 2018 at Leicester’s Haymarket Theatre and other participating venues. Every year around the world over a million people take their own lives. A suicide every 30-40 seconds. That’s more deaths than wars, more than murders and, in many nations – including the UK – more than four times the amount of road traffic deaths. And it’s rising. For every suicide there are 20 attempts. That’s over a billion people around the world thinking about killing themselves in any year. Suicide is the most dangerous and taboo tip of the mental health iceberg. Still we ignore it and pretend it doesn’t happen to ‘ordinary’ or ‘normal’ people. But it does. Suicides are preventable. It starts by raising awareness. Wanting change. Talking about it. Demanding change and attention. We’d love you to join us.